Oh Shell Ya! G’day, Mates! Bella and Alex posting from the land down under on our February Teen Science Cafe with the brilliant Aussie, Holly West herself! 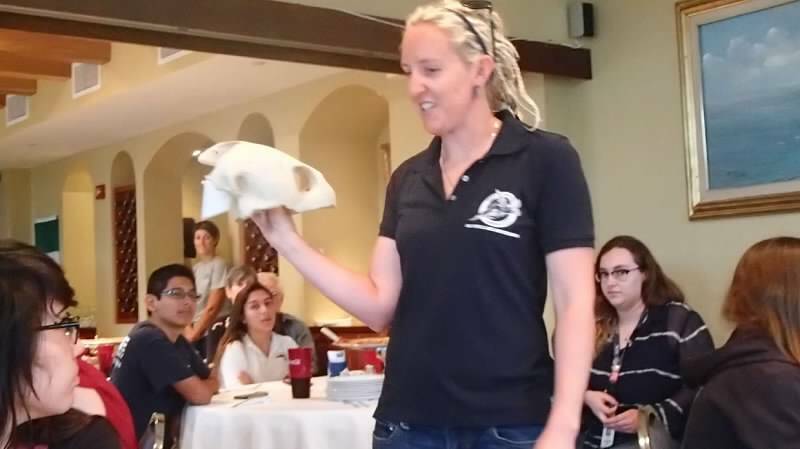 As Mote’s primary sea turtle care taker and researcher, Holly was able to share an incredible amount of experience and stories from her work, all while rocking dreads. Some of the cutest of these stories included the hundreds of baby sea turtles that came into the nursery late last summer. Cue the “Awh!”. Now that these lil’ babes are out exploring the great big blue, Holly is focusing in on her research with Mote’s resident loggerheads, Shelley and Montego. Studying their auditory sense, she’s found that the girls, like the teenagers attending the cafe, are highly food motivated. Our attendants were very sticker-motivated as well. 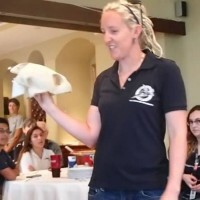 Holly’s hands-on activity took on the form of a quiz – bringing out everybody’s competitive side- and was complete with the turtle conservation stickers aforementioned. Thank you to all those who were able to attend our 2nd full house in a row! Like a sea turtle on their birthday, we SHELLEBRATED this achievement! Be sure to check back here soon for our next installment.